The company YBVR (Yerba Buena VR) joined the GSIC in April of 2018 and since that moment the US / Spanish startup has been making success wherever it went. They have collaborated with the Madrid Mutua Open, they won the Startcup Challenge 2018 (the startup competition that took place at the World Football Summit 2018), they have been winners of Sport Thinkers Smart Stadium and now they are planning a pilot with the Real Sociedad football club, and this January they have been at the Australian Open producing contents for exclusive virtual reality experiences in 360 live video. We interviewed Hector Prieto, the CEO of the company, while he was at the Australian Open. Hector shared details of the experience he was living during the days of the championship, as well as the history of the path he took along with his start-up towards Melbourne Park. Q: Hector, first of all, congratulations for getting this project! 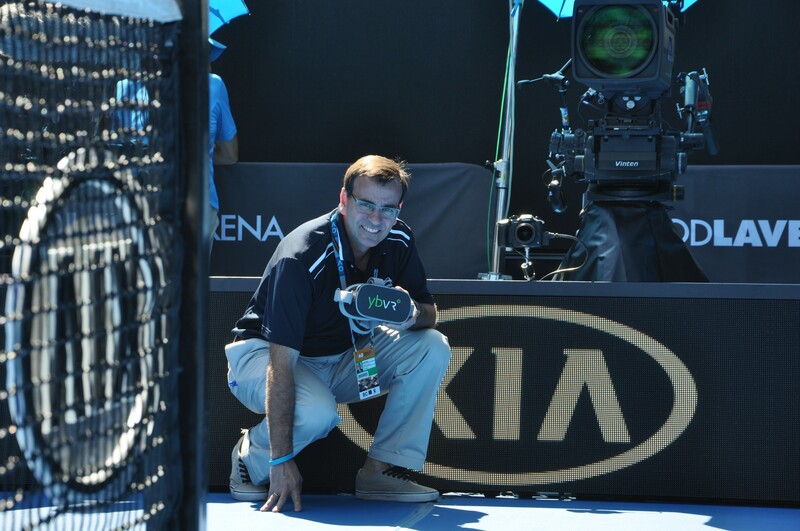 Tell us, how the experience at the Australian Open is going? A: The experience here is fantastic. Australia is a country with a very young and very fresh mentality, where collaborations between companies are pleasant. I personally feel Australian Open not as a client, but as a partner. They have made us part of their team, and the collaboration with the organization of the event is being very good. Q: What do you exactly do at this tournament? 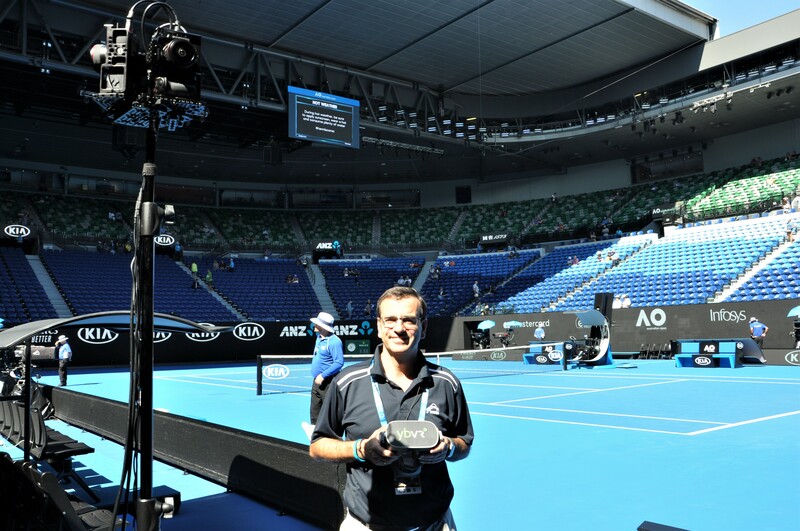 A: We have placed three cameras in the main court, Rod Laver Arena, one of them is 360 degrees and other two are 180 degrees vision. Every time we are looking for the best position, every day we improve also thanks to the people who work in the organization, since they know the field very well. We are producing two games every day, one women match and one men match. We make a summary of the game by providing the highlights in a 3-minute immersive video that can be viewed from the virtual reality hedsets application. When the semi-finals begin, we are going to broadcast all matches live. Here they have a kind of VR Zone, where people can live the experiences as if they were on the main court. Another thing we are doing here is recording videos behind the scenes. This novelty has been created by the organizers of the Australian with the idea of telling stories that happen during the championship beyond tennis. For example, we shoot what a tennis player does before entering the court, how he/she warms-up here in a hallway, or how nervous he/she is. Our mini production room is right in a tunnel where tennis players go down to Rod Laver and we can see them, they look like gladiators coming down to fight at the arena. A lot of things happen here. There are concerts, there is a children’s area, there are bars and restaurants … We are in the middle of summer and the atmosphere is amazing. We are capturing all that in different immersive clips, 2-3 minutes videos that are put together in a pack of immersive content that, apart from being very innovative, are very interesting. Q: If we are the users, how can we access all these contents? A: With virtual reality headsets and Wi-Fi connection you could easily access through our YBVR application. This year, due to a rights issues, the contents of the Australian Open are not available for users in a massive way, this experience is only being offered at the championship venue where attendees and clients can enjoy it. It’s possible that during the Laver Cup [tennis cup that will take place in Geneva in September] they will distribute these contents to all users. Q: Let’s go back to the beginnings of your start-up. How did the idea of creating YBVR come up? A: The story is almost personal, as in most cases. Two of us – Constantino [Constantino Villar, Co-Founder of YBVR] and I – were lucky enough to set up another start-up related to TV over IP that Ericsson acquire years ago, and that’s where we met with Victor and Sebastián, two other founders of YBVR. Working at Ericsson we had a very interesting access to what was happening in the Silicon Valley in technology and media. When we saw that the virtual reality area was emerging very strongly and that there were millionaire investments in the headsets. My colleagues began to “pinch” me saying that it was our time to leave Ericsson and go back again to the entrepeneur life. I couldn’t resist, because that entrepreneur inside me was there, beating. The idea of transmitting the events in virtual reality live arose because we saw that 360 videos were really interesting. There was only one piece that was missing, because the headsets and the 360 cameras were already being resolved, but no one thought of how to distribute so much information online, because the quality needed for Immersive videos is is 8K and that is a lot. We thought and figured: “Who better than us, video streaming engineers who were working in Ericsson compacting the video so that it enters through the mobile networks, could do that?” We thought it was a nice challenge to have! A: This was in 2016, and the idea was as diect as saying: “Why are we going to send the whole video? Why don’t we send only the part where the user is looking? Then we put the highest quality where the user looks, and we begin to degrade little by little. We did a pototype and a lot of tests, we saw that we got almost four times more quality with half the bandwidth and we thought we were on the right track. So, in August of 2016 Ie decided to leave Ericsson. I was a well-paid executive, working in a multinational company in the US, with three kids in college. We were brave enough to go for it. In November of 2016 we incoporated YBVR in USA with a subsidiary in Spain and that’s how we started. We spent a whole year developing the concept and the product, and in 2018 we started selling. Now we have 11 clients, a turnover of 400 thousand dollars, and we are very happy with how things are going. Q: How did you get to the Australian Open? Where did you start? A: Constantino comes from tennis, he was a semi-professional of this sport, and at the same time we knew, that our added value was to broadcast live, so we started talking with the Royal Spanish Tennis Federation and they introduced us with the International Federation who organizes the Davis Cup.The first event that we did was the Spanish Championship, but right away the Davis Cup came, and we did it in Marbella and Valencia. Then we got a contract with the Mutua Madrid Open in May of last year. It turned out that Mutua Madid Open organizers got very happy with YBVR tech and when thee were at the Wimbledon championship, they talked about our solution with the organicers of the Australian Open, and so I came to Australa to show what we did in Madrid. Australian Open CEO was very impressed with the quality of the image, he was shocked to see even the marks of the footprints on the sand. He asked us if dared to do the Australian Open and here we are. Q: Do you also do other types of events or for now your only focus is on the sport? A: Yes, we have done more projects in education and tourism, but I will be honest: for now, we have only found the business model in sports. I believe that for now there is not enough traction in the market for many VR applications of other things. So, we have decided that for now we will focus on sports and then we will try other areas. Q: What is that business model? A: We have set a criterion: we are working mainly with companies that have sports rights. For example, the organizer of the Australian Open has his sports rights, as LaLiga has his own in football. So, beyond making a brand activation and a “wow” effect, what we are looking for is a model where our client multiplies the value of their sports rights. The challenge we have with the Australian Open is to get their media rights revenues up by 10% in 3 years. And it is what we are doing. A tournament like this one makes money mostly out of media rights and sponsorship. 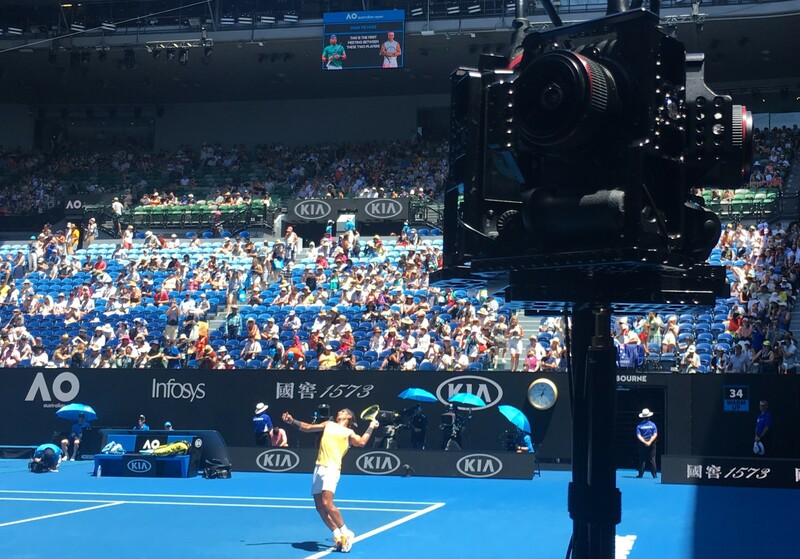 With our tech they are providing the immersive service to the broadcasters who will actually pay the Australian Open for our work. Q: And what kind of challenges do you find in the industry? A: I always say that the difficult part for the technology company is not technology itself., I don’t say is easy, but our technologists are very good, and they always makes things work. What is really difficult is to penetrate the market. And it is even more difficult in an environment where the business is still to be established. At some point we realized that we should consider the world of sports because they are always looking for the latest technology to please the fans. Then we saw that wherever we went, we called attention, because what we do is very visual. Once we have broke in, the challenge is going to be to consolidate our company and find a sustainable business model. I must also say that we are very happy with how things are going, and I think that our membership in the GSIC has helped us a lot in this sense. It has given us wings after applying to and winning the World Football Summit 2018 competition. Now more projects are coming, and not just tennis, therefore, maybe it is not so difficult to find the opportunities allowing us to consolidate the YBVR business. Q: Thank you, Hector! To finish, could you leave a message for other technology start-ups and entrepreneurs in our sector? A: I would tell them to have the courage and go for the challenges that are proposed. We put on the challenge when we did the Davis Cup in Valencia. We said: “We have to get to the Australian Open.” And I never thought that it would happen so fast, but you just have to start and not be afraid. The next goal is to make the other three tournaments that make up the Grand Slam: Roland Garros, Wimbledon and US Open. We have to do all four. Let’s see how long it takes.